I’m reluctant to call it an argument or a row because, actually, it’s nothing like that. It’s only people like Asda getting it wrong, being told they’re wrong, then given evidence that they are wrong, then shown that just a few years before they were getting it right, and that their website still gets it right, but being too embarrassed to admit they were wrong. 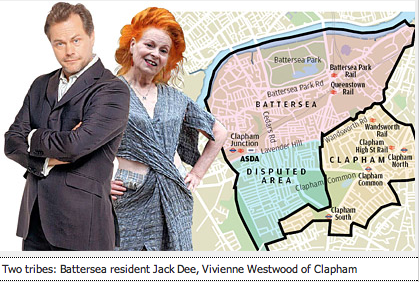 But the Evening Standard produced a useful map, highlighting Battersea, Clapham, and the “disputed area”. I rather like that, it gives it an air of mystique. It’s got the behind-enemy-lines sort of sound that belongs to a Bond movie.